Window attachments are products installed either internally or externally on a window that can serve a variety of purposes including: adding to the room aesthetic, protection, enhanced view and natural light, reducing draftiness, lessen glare and heat from the sun, or privacy. These products include low-emissivity (low-e)storm windows and interior panels, cellular shades, interior and exterior shades and shutters, window films, solar screens, window quilts, window films, and awnings. Examples and descriptions of window attachment products provided courtesy of Efficientwindowcoverings.org. Flexible adhesive polymer sheet applied directly and permanently to interior or exterior of glass to improve the window’s optical and/or thermal performance. Often called applied film to distinguish it from seasonal film (which is applied to window trim, not the window glass). Many variations exist for additional desired performance including: glare reduction, privacy, security, and winter thermal performance. An exterior shading window covering, either fixed or retractable. Fixed awnings provide good solar heat gain and glare control while reasonably maintaining view. Retractable awnings provide good solar heat gain and glare control while maintaining view. Their adjustability improves qualities such as privacy and glare control. Most commonly, louvered window covering with stacked vanes that can be both tilted and raised/lowered. Most commonly, window covering made of pleated fabric that is “honeycombed” and can be raised and lowered. Their adjustability adds elements balancing view, privacy, glare control, and daylighting. Also called insulated cellular shade. 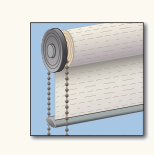 Interior fabric window covering hanging from a rod, often paired in a window and hanging in loose folds; similar to and often including drapes. Exterior louvered shutters protect existing windows from weather and improve security and privacy. Certain types also provide excellent solar heat gain control. Exterior roller shades cover and protect existing windows from weather and provide solar heat gain control. Their adjustability adds elements of view, privacy, and glare control but can reduce existing window protection. Exterior solar screens provide good solar heat gain control while reasonably maintaining view. Exterior window panel (tracked/operable or fixed/inoperable) covering and protecting existing windows from weather, improving energy performance (including air-tightness), while maintaining view. Low-e coatings in cold climates and low solar gain coatings in hot climates increase their energy performance. Interior louvered shutters provide solar heat gain control. Their adjustability adds elements of view, privacy, glare control, and daylighting. Interior panels primarily reduce winter heat loss and improve air-tightness while maintaining view. Low-e coatings further improve their insulation properties. Pleated shades provide solar heat gain control. Their adjustability adds elements that balance view, glare control, and daylighting. Roman shades provide solar heat gain control and limited insulation. Depending on fabric type, they can also provide good sound absorption. Their adjustability adds elements that balance privacy, view, glare control, and daylighting. Roller shutters protect existing windows from weather, including severe weather, and improve security and privacy. They also provide excellent solar heat gain control. Insulated versions substantially improve resistance to heat loss in cold climates. Sheer shades provide solar heat gain control. Their adjustability adds elements that balance view, glare control, and daylighting.